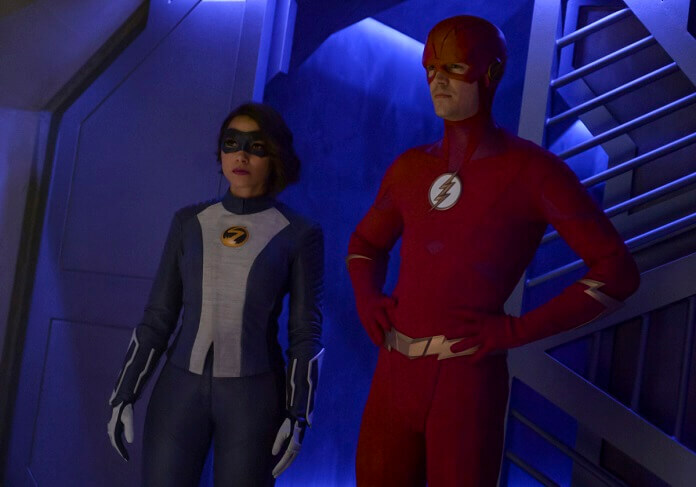 The Flash Season 5 Episode 7 Recap and Review: "Power Outage"
“I know we didn’t get off to the greatest start, but I want to fix all that,” says Orlin Dwyer aka Cicada (Chris Klein) to his niece Grace in a flashback scene revealing Cicada’s past in season five episode seven of The CW superhero series, The Flash. As the episode begins Orlin’s visiting Grace in the hospital when he hears Barry Allen (Grant Gustin) asking for Grace’s room. Orlin stands off to the side, out of sight from anyone entering the room. Just as Barry’s about to go into the room, he’s stopped by Dr. Ambres who asks him what he’s doing there. He tells her he’s CSI and needs to talk to Grace’s father. Dr. Ambres reveals Grace’s father is dead and she doesn’t have any other family. Barry, surprised, thanks the doctor and leaves. After he leaves, Dr. Ambres gives a knowing look at Orlin. At Barry’s loft, Barry and Caitlin (Danielle Panabaker) are working together in the kitchen preparing pies and other food for Thanksgiving. 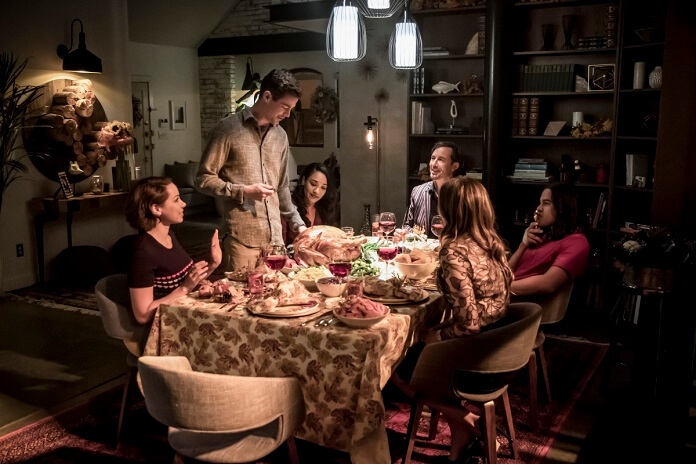 Barry points out to Caitlin that Joe and Cecile are spending Thanksgiving at Cecile’s family’s home. Barry confides in Caitlin he’s realized this will be the first Thanksgiving Nora has with him since he disappears in the future when she’s still so young. He wants this Thanksgiving to be perfect. Iris (Candice Patton) and Nora (Jessica Parker Kennedy) walk in from having a mother-daughter day together and sit for a chat. Nora brings up the Singularity and how Barry saved the day and how thrilling it must have been to be there to see it like her mom did. Iris admits it was terrifying because they thought they were going to lose him. She also tells her about him going into the Speed Force and how they believed that was a one-way trip. Nora confesses she didn’t realize Barry had so many close calls. A flashback scene reveals Orlin is told by authorities that his sister had an accident and he’s the legal guardian of her daughter, Grace. It’s clear he doesn’t want her or the responsibility. At S.T.A.R. Labs, Sherloque (Tom Cavanagh) tells Cisco (Carlos Valdes) he just doesn’t get Thanksgiving. Cisco and Caitlin both try to explain that it’s a time to spend with family and friends, but an alert goes off and they rush into the cortex to hear about a big lightning storm over a power station. Barry and Nora speed over to the power station, and Iris instructs Nora to evacuate the workers while Barry makes sure the storm doesn’t strike the cold fusion core. If it does, it’ll take out the whole block. The Flash notices lightning’s about to hit it and speeds in front of it, taking the lightning strike hit dead-on. Barry absorbs the blow, falls to the ground, and Nora rushes over. She becomes upset when she realizes Barry isn’t breathing. Caitlin, monitoring his vitals at S.T.A.R. Labs, says he’s going into cardiac arrest and wants Nora to shock Barry’s heart. Nora, crying, asks how to do it. Caitlin talks her through it, instructing her to rub her hands together to create lightning and then give him a chest compression. Nora follows directions but Barry lies motionless, still without a heartbeat. She tries again…still nothing. “It’s not working!” cries Nora while back at S.T.A.R. Labs Barry’s vitals stop. “We lost him,” says a concerned Caitlin. “No, no…please,” cries Nora as she tries again and again, hitting Barry with lightning chest compressions. Finally after several tries, Barry’s heart is jump-started and he wakes, gasping for air. “He’s back,” says Cisco to a very relieved Iris and Caitlin. Nora holds Barry in her arms, sobbing over almost losing her dad. Over at S.T.A.R. Labs, Cisco and Caitlin invite Sherloque to Thanksgiving dinner but he turns them down. He then goes off on a tirade about how little they have to be thankful for…Caitlin losing her dad twice, Cisco getting wounded by Cicada and not being able to use his powers. Sherloque ends up depressing poor Caitlin and Cisco. Believing the Weather Wizard (Liam McIntyre) might be behind the attack at the power plant, Barry, Iris, and Nora check and see if he’s still locked up at Iron Heights. He is. Iris checks on the security footage and that’s when Joss Mardon (Reina Hardesty) breaks through the roof of the building. It turns out Joss is the Weather Wizard’s daughter. Barry speeds Weather Wizard out of his cell and over to the pipeline and then returns to confront Joss. Joss warns The Flash and XS that if they don’t bring her father to her, she’ll level the city. Barry has a talk with Weather Wizard who admits he was a bad father because he was focused on being a criminal. He also reveals Joss and her mother had a falling out. “Sometimes that happens no matter how hard you try,” says Weather Wizard. Another flashback scene shows Orlin being called to Grace’s school because she used bad language and acted out. He tries to talk to her but she refuses to listen. She finally admits she learned the language from hearing him use it. She says he’s supposed to make things better but only makes things worse. Caitlin checks Joss’ background and discovers she used to be a storm chaser. The staff Barry saw her holding is how she can manipulate the weather; it’s more meta-tech. Iris says they’re running out of time, and Barry believes the only option is to give Joss what she wants. Flashback to Orlin showing Grace a house that needs some fixing up. He reveals his cousin said they can live there if he works on it. Orlin shows Grace a dollhouse that’s also a work-in–progress, confessing he wants her to have all the things kids are supposed to have. She smiles and agrees they should start with the dollhouse. Joss (also known as Weather Witch) shows up and Barry has her father with him. Weather Wizard asks his daughter to let him have a go with the staff, but instead she uses it to make a Humvee come crashing down on him. “Oh, don’t worry. He was a bad man,” says Joss. As Joss is about to take off, the Humvee moves and it’s easy to tell the Weather Wizard is just a hologram. Infuriated, Joss warns The Flash if he doesn’t deliver Weather Wizard she’ll destroy Central City. Barry’s about to go after her when Nora tells him not to. She doesn’t want to lose her dad. One more flashback reveals Orlin and Grace are at an amusement park having fun on the anniversary of their moving into the house. He gives her a present: a family for her dollhouse. Just then the satellite explodes in the sky and debris starts falling in and around the amusement park. Orlin and Grace run but he’s hit by a big piece of debris from the satellite and Grace gets knocked unconscious. Orlin manages to stand and carries Grace to a hospital where Dr. Ambres looks after them. At S.T.A.R. Labs, the gang receives another alert that a storm is approaching the airport. Barry and Nora speed over, and Barry evacuates all the nearby people to the hanger. Joss shows up and demands her father. The Flash assures her that’s not going to happen, but if she’s upset she can take it out on him. Joss refuses that offer and claims she’ll punish her dad by hurting innocent people. Barry run in circles the same way he did in the pilot to stop the weather tornado from Joss’ dad. It works, and The Flash is able take Joss into custody. The gang reunites to celebrate Thanksgiving, and Sherloque gives a toast to new friends and family. Barry and Nora have a talk and he explains he’ll always sacrifice himself for those he loves. “I’m The Flash for my family,” explains Barry. Nora understands and, just like her mom, will try to learn to deal with it. Serious conversations finished, they gather around the table for the Thanksgiving feast. Elsewhere, Orlin arrives at the hospital to spend Thanksgiving with Grace. Another flashback reveals Orlin being told by Dr. Ambres that Grace may never come out of the coma. He starts to blame himself but Dr. Ambres assures him it’s not his fault. Orlin watches a news report about The Flash destroying the satellite. As he gets angry, the piece of the satellite that wounded him flies into his hand…it’s his lightning blade. He speaks to the comatose Grace, telling her he’ll make it right and kill all metas. Season five episode sevent titled “Power Outage” is one of the best episodes this season. The episode returns to the original formula of season one by introducing an evil new meta of the week. It also revealed the backstory of the main villain and had exciting action scenes along with humor and plenty of heart-touching moments. It recaptures the spirit of the first season and also returns to the structure of the first (and best) season. That approach has sadly been missing for many episodes. The stand-out performance goes to Jessica Parker Kennedy who shows brilliantly just how scared Nora is to lose her dad now that she has him in her life. The scene with her crying and asking how to revive Barry when he’s going into cardiac arrest is so suspenseful and moving. Kennedy and Gustin also have wonderful chemistry together as father and daughter. With Team Flash now knowing the identity of Cicada, what will there next move be to find a way to stop him?